The Backloading Company are here to help you. Here are some images of what NOT to do when moving house. DO NOT fill your fridge with anything. Your fridge is required to be empty whilst in transit. Remember to empty your fridge and turn it off well before moving. It's always a good idea to also allow your freezer to defrost. 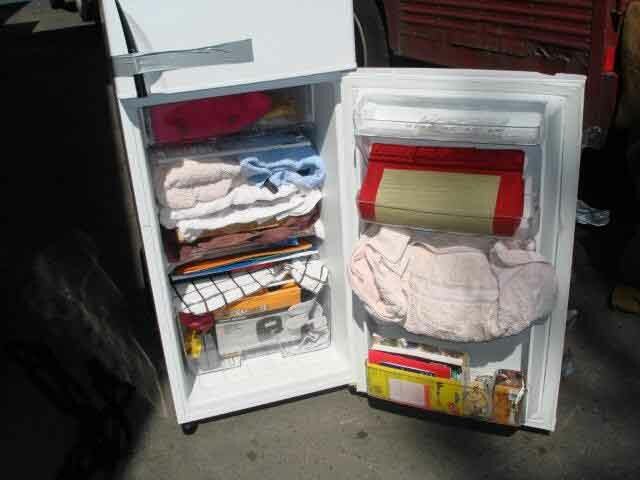 Remember to leave your fridge &/or freezer standing for a few hours after your move before you turn it on. Again, don’t fill your fridge with items that could easily be put in a box. Your fridge will be safer when empty. Fridges are already heavy and do not need extra weight packed inside them to risk the function and interior of the fridge. An empty refrigerator will help take the hassle out of moving this heavy item and get your removal happening quicker with less damage to your fridge. Do NOT replace proper removal cartons with plastic tubs. It is always best to have all your small items packed into a proper packing box, especially if you are moving interstate. 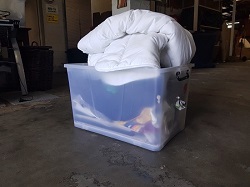 Plastic boxes are a good way to move small loose items locally, however, many people don’t quite understand that plastic tubs are built for the sole purpose of STORING items around the home, they are not built and equipped to handle weight while in transport. The images below show improper packing of plastic tubs, and for people to assume their goods and precious items will travel safely in transit while packed in this condition is careless preparation for the move. We also recommend that if your furniture was originally flat-packed, that you dismantle it back to a flat-pack state before the move. Items purchased and received in a flat pack condition, are not suitable for transport in an assembled manner. Just like a fridge, packing goods inside a TV unit and/or cabinet is careless packing. You cannot expect a furniture item to arrive without some form of damage when it has been packed like it is a removal carton. The weight placed inside drawers, cabinet doors, etc. when they have been loaded up (as in the picture below) is too much weight for furniture to withstand. 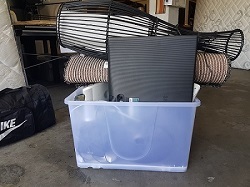 These items are of course perfectly fine when situated in a home, however, moving them while loaded causes the base of drawers &/or cabinets to give way, the back boards to detach and in some cases, the doors to completely break. This is not a good idea. It could damage the TV unit and items inside it, and make this TV unit much heavier then it normally would be. Do NOT use garbage bags as a replacement for removal cartons. Even with soft items such as linen and clothing, garbage bags tear extremely easily and are certainly NOT SUITABLE for packing. it is much better to fill boxes with items to be moved because there is a better chance those items will be safe and it makes it much easier to stack the items inside the truck for backloading. Loose items, such as garbage bags, cause movement inside a removalist pan/trailer, because they are not stable items. Once a garbage bag moves inside the pan/trailer, it causes all other items loaded around1 this bag to move out of place. Although furniture pieces are stationary when travelling in transit, the vibration and rough roads trucks (just the same as cars) must travel over throughout Australian, causes jolts inside the pan/trailer of a truck. For example, when packing a car boot for a holiday, travelling over a speed hump and pot holes on the roads will cause the items in the boot to jolt and move. This is the same for a furniture truck, just on a much larger scale.